Poor reading fluency is a challenge many students face. If a student is using all their mental resources decoding words and doing the foundational skills of reading, they have very little left to spend comprehending. This is especially troubling with the increased focus on critical thinking and understanding the nuances of text that are embedded in the Common Core. However, unlike comprehension deficits, there are a number of strong, simple to implement interventions that can improve student fluency. Because reading fluency is such a foundational part of reading for meaning, I wanted to share a freebie with you. 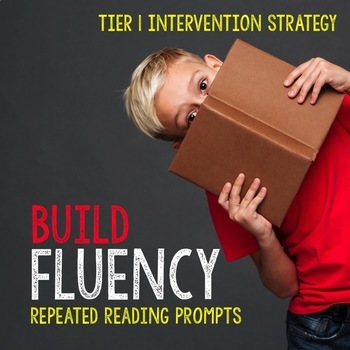 This freebie focuses on repeated readings, which are a well-documented intervention for fluency issues. It is also one of my favorite interventions to implement at Tier 1. Why do I like repeated readings? Well, its quite simple really. The student gets multiple chances to read the text and gets the feel the success of becoming more and more fluent each time. From my experience, struggling readers desperately need this feeling of success because their experiences with reading have ultimately been linked with feelings of failure and inadequacy. That being said, repeated reading can be B-O-R-I-N-G! This is even more so for those students who didn't want to read it the first time! In my room, I have my students partner up and read for fluency practice. The whole class does it for the first part of the year, and my struggling readers continue throughout the year. The rest of the class does it at random intervals or during partner reading time. First I read the poem and students follow along. After hearing me read, they read it to their partner and switch jobs so both partners can be the listener and the reader. Finally, I have students read WITH their partner. By this point the student has now heard or recited the poem four times…which tends to be the line where boredom kicks in. At this point, I get creative. Actually, I pull out the cards I made containing all sorts of funny and crazy ways we could read. Old man voice ? Check! Opera Singer? Yep. I've got that, too. While it might sound silly, the kids eat it up with a spoon. Whether it is a trying out a new accent or using their quietest whisper, I never hear a complaint about having to read the poem again. It is hilarious to hear them. All their funny voices crack me up because the kids take it so seriously. The room is full of engaged, excited readers…despite the fact they've already read the material four or more times. Originally I kept all these ideas as a list. However, after a few years, I decided to create the list into a set of cards. Each pair of students gets a card picked at random, and that is the voice they use for their partner reading. When they finish, they switch with another team or pick a new card for the third reading. Easy peasy! It takes all of 10 minutes, and while it can get loud, it is controlled chaos and the students are having a blast. I think my personal favorite is the poem about the purple cow done in a perfect imitation of an old, old, OLD man. I am pretty sure the kiddo even threw in a “Sonny” at the end of it. How to get my repeated reading fluency cards for free. These free reading fluency cards are available in my Teachers Pay Teachers shop. What strategies do you use to keep your struggling readers (or all of them) engaged and excited to read? These cards are great! We also do choral reading with poetry, and I call on kids to tell us how to divide it up. So we might do by birthday seasons, age, where you sit, etc. BUt this will crack them up! Great idea! It's a very creative way to make repeated readings fun. I love using Readers' Theater in my classroom for the same reasons. Thank you for sharing! This is so much fun! I love the ideas you came up with for the voices. I love doing this type of thing with my students! This is perfect for all of my intervention groups! Thanks for sharing!! Awesome! Can't wait to try these after spring break with my kids! We do a Reader's Theater about once a month- my students love them and beg for more! I like your idea of using cards for different voices! I love the idea of the cards and voices! My little ones (kindergarten) will LOVE this!! We work A LOT on tracking..one way that we keep them motivated to track is by adding a "reading buddy" to their "reading finger"! We put a little smiley face stamp on their index finger…they LOVE this!! It helps remind them to keep tracking when they are reading..they have to read to their "reading buddy" LOL! Thanks for the cards! I can't wait to use them!